The Book of Mormon, a fever-dream creation of the two guys behind the TV series “South Park,” is vulgar, irreverent, smart, blasphemous to just about anybody’s religion, hilarious, high-energy and ultimately touching. So when exactly was the last time any musical gracing the Hobby Center stage was all those things? At the same time? More than a few things about the show are unexpected: the reliance on wild and homage-driven choreography (Fosse anyone? ), for instance, or the innovative ways Trey Parker, Matt Stone and others have found to take the manic world of their small-screen animation and use it to fill a very big stage. While fans of “South Park” insist it was already there for true believers, there is a sweetness and, wonder of wonders, idealism at this show’s heart that transcends that of the Mormon missionaries being skewered by the story and nearly every one of the songs. Out of these parts, the creators give us, at least on the surface, a cavalcade of how stupid the narrative of Mormonism truly is – interestingly, the Church of Jesus Christ of Latter Day Saints has several ads in the show program. Song after song reenacts with relish the whole Jesus-came-to-America yarn, complete with unknown tribes of Israelites doing unknown Israelite kinds of things. And when not referencing that foundational weirdness, there’s Joseph Smith, his famous angel and those golden plates dug from the ground in upstate New York, and then Brigham Young. Oddly, there may not have been a single joke about bigamy. The theater sound still needed some balancing last night, so quite a few song lyrics were lost. Based on the ones that were found, that was a shame. Maybe there were some bigamy jokes. In addition to the same gentle and not-so-gentle deflating that any organized religion might be vulnerable to, The Book of Mormon rises miles above expectations by actually making us like its protagonists. Few people on earth actually want their doorbells rung by Mormons, but a lot of people would enjoy spending a night in the theater with these particular Mormons. 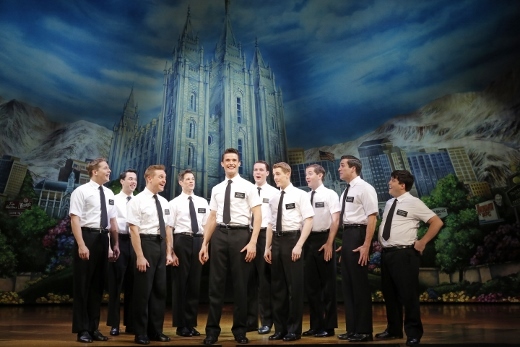 Led by Mark Evans as Elder Price and roly-poly Christopher John O’Neill as Elder Cunningham, the missionaries emerge as real people with real cares – which seems to be part of the show’s message. Even better, the Ugandans headed up by Samantha Marie Ware as Nabulungi and Derrick Williams as the cruel warlord known as The General, make for a sharp and meaningful contrast. Throughout, the Africans’ embittered and understandably vulgar language is a constant reminder that these “oh gosh darn” missionaries are trying to help people without knowing (or caring) a thing about them. There are moments of inspiration, even heroism, in The Book of Mormon, but they’re probably not what you’d expect. The fact that they come packaged in Parker-Stone potty-mouth should come as no surprise. Mormon is a ridiculously good evening of musical theater, enshrining the same traditions of Broadway it so skillfully eviscerates, and inviting us to a kind of belief that runs deeper than what any religion, any holy book or any silly golden plates in the ground can begin to describe.